MDPV is a potent, synthetic euphoric stimulant with a short history of human use, which shares some empathogenic effects with MDMA. It is known for its tendency to cause compulsive redosing and some users report sexual arousal. 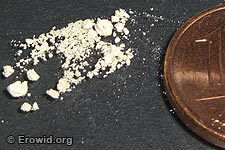 MDPV has been found in products sold as "bath salts", "plant food/fertilizer", and in some cases "ecstasy".